Upslurred whistled “wurp?,” and a low “quirk.” Short warbled song is rarely heard. Description: Slender, with a conspicuous crest; longish tail; red eyes; and upright posture. 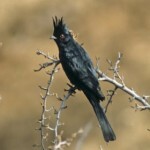 Male is shiny black overall, with white wing patches that are visible only in flight. Females and juveniles are gray overall, with gray wing patches. Behavior: Forages for insects like a flycatcher. Has a distinctive fluttering flight. Habitat: Usually found in hot areas with single, tall trees, and plenty of available mistletoe or other berries when flying insects are scarce. Where in Nebraska: Accidental. Seen in Alliance, Box Butte County in 1983. 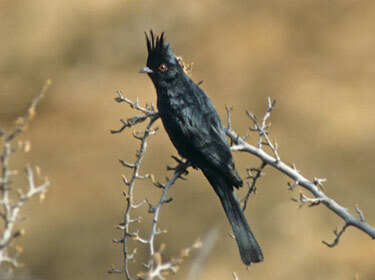 Fun Facts: Phainopeplas rarely drink water even though they lose up to 95% of its body mass in water a day. However, they get there water from the minimum of 1,100 miseltoe berries they consume a day.